In 1977, two old veterans of the classic Beijing Opera are reunited after long inactivity and estrangement. The story ranges over their entire careers, going back to the 1924 warlord era when they were both child apprentices under a brutal, abusive teacher.... By 1937 when war with Japan is imminent, Douzi (now going by the professional name of Chieng Dieyi) has a wealthy patron, while Shitou (aka Xiaolou Duan) marries a beautiful and headstrong prostitute (Li). These outside relationships put a severe strain on their professional team, and further large developments -- the Japanese occupation, the Nationalist uprising in 1945, the Communist revolution in 1949, and the devastating Cultural Revolution of 1966-- lead the characters into lies, betrayals, trials, and deaths. This gorgeous, crushing, magnificently written (based on the novel by Lillian Lee) and acted epic was released in 157 minutes in the U.S. but its original Chinese print is 171 minutes long. 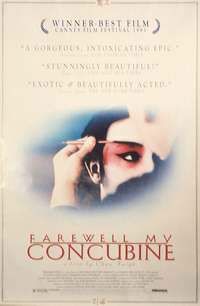 For once the astonishing Gong Li is out-acted by a man: Leslie Cheung in the title role.